With its unique location high up in the Beaujolais hills, Domaine de la Chapelle de Vâtre is an ideal venue for a conference, seminar or team building activity. The 17th Century Chapel, which is part of the Vâtre estate, has been refurbished to a high standard. 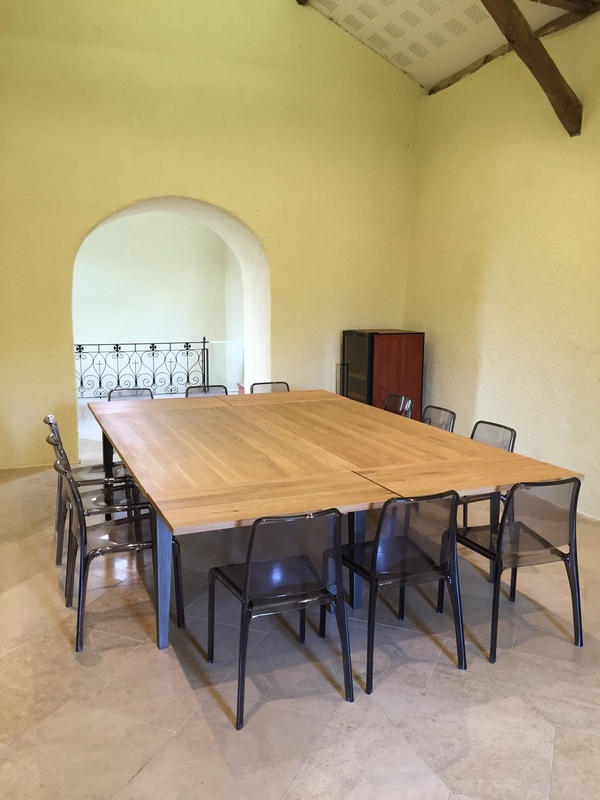 In a Board Room layout the Chapel can comfortably accommodate 12 people. However the layout can be changed to accommodate most requirements. It is fully equipped with overhead projector, flip chart and Wi Fi. The Chapel, together with the on-site accommodation, can be booked on an exclusive basis from November to March, providing a private venue for the desired meeting or activity. Primarily the Chapel is offered together with La Roche, a spacious house comprising up to four double bedrooms with en-suite bathrooms. La Roche also provides an area for participants to relax or to take advantage of some of the facilities including a pool table in the games room. Lunches are provided in La Roche where a dinner can also be provided if required. Additional accommodation is located in the adjacent buildings. Naturally a tour of the vineyard and a wine tasting is included, which, if required, could be extended to include a half day wine bottling and labelling activity. The region surrounding the vineyard offers opportunities for walking, sightseeing and sampling Beaujolais specialities at local restaurants.